I've been wanting to write about DNA for a while, but haven't found exactly the right angle. So much is aligned with it. There's something seemingly innately cosmic or esoteric about it, and there are many possible reasons why, from the obvious and logical, to the mystical and outlandish. After reading Sergi Cortinas Rovira's the article, Metaphors of DNA: A Review of the Popularisation Processes ,taken from his PhD thesis, I realized the reason for the innate cosmic and esotericness might be due to the way the discovery and continued presentation of DNA has been accompanied by notions and words that easily fall into, well, the cosmic and esoteric. As Rovira points out, Crick and Watson introduced DNA publicly by asserting the "secret of life" has been found; Rovira also notes that the words secret, code, decipher, and decode have been associated with the presentation of DNA from the very beginning. With the huge popularity of books like The Da Vinci Code in a mainstream audience, it's clear these are great ideas to take to market. There is also the interesting metaphor of letters and text, and as Rovira states, many popular analogies describing the intricacies and functions of DNA use letter, word, and book metaphors. This is also a popular theme within esoteric writings—the idea that DNA is something of a computer program placed by aliens, or otherwise ancient creators. Also, that its double helix is the real image behind the Hermetic symbol of the caduceus, or behind shamanic visions and information. Like I said, so much is aligned with it—including the story that Francis Crick actually first perceived the double helix structure of DNA while under the influence of LSD. So, are the mystical attributes and literary metaphors simply tacked on to DNA randomly and perpetuate, and ending up as some kind of cultural myth to inject meaning, or—is there something inherent in DNA that attracts and supports the appointment and perpetuation of the attributes? And what of Crick's psychedelic original vision of the DNA structure? Well, I recently had an experience that had me considering psychedelic aesthetics and DNA. I've written in a recent Medusa's Ladder about my exploration of crafting magazines and books; recently, at the bookstore, I pulled a macramé book off the shelf with a title something like, "Totally Contemporary Macramé." After flipping though it, I realized even if you fashion fabulous material into an iPod case, or Nalgene cozy, macramé is macramé. And it doesn't look totally contemporary, it looks like it belongs holding a fern in the window of Rhoda Morgernstern's apartment. Not that there's anything wrong with that. Although I didn't get into that book, I did check out a book from the library called Hemp Masters: Ancient Hippie Secrets for Knotting Hip Hemp Jewelry hoping to learn some basic knots, which, it turns out, are macramé. I am not very good at translating written and visual diagrams like the ones in the book, so I decided to find the most basic step in making the most basic knot, and start trying it hands-on, to get the feel of it on my own terms. I did something wrong, and instead of looking like a spindly wad of badness, it stunned me. I ended up with a perfect-looking hempstrand of DNA, complete with double helix and little ladder steps. Because it was so unexpected, it actually felt a little mystical, and I was a little freaked out. All I was doing was making these very simple little knots, and it was spiraling of its own accord. With all the art and craft things I have been involved in over the years, anything fiber-oriented has not been part of it. This macramé seemed like crazy creation magic. I decided to try this weird DNA strand thing with very fine gauge wire. It didn't come out looking so much like DNA because I wasn't able to pull the wire tightly enough, but it began to look exactly like a tiny human spine and ribcage. Again, crazy creation magic. 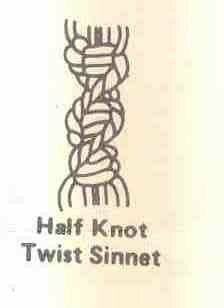 After reading further, it turns out I was making a half knot sinnet, and one of the natural effects is the spiral shape. Whatever the case, I find it interesting that the most basic knot of macramé--a hobby and very particular and identifiable aesthetic so popular in and associated with the psychedelic decades—looks exactly like the double helix of DNA, the same form that was first "seen" during a psychedelic induced vision.